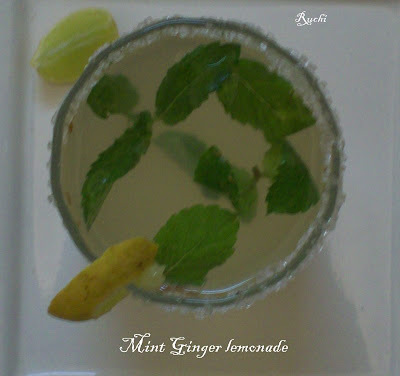 Mint Ginger lemonade is awesome refreshing summer cooler made from lemons, water, sugar and fresh ginger juice with mint. It infused with the flavors of ginger and mint with a zest of lime is a booster that energizers your systems. For those who do not want to add sugar can replace sugar with honey or any sweetener of your choice. Put this mixture in a serving glass. Garnish with few mint leaves. Its just refreshing on a hot summer day. To decorate glass edge,make the edge wet with the help of water.In a bowl take some good amount of sugar.Dip the edge of glass into it and put it in freeze foe 15-20 min..Take it out just before serving. 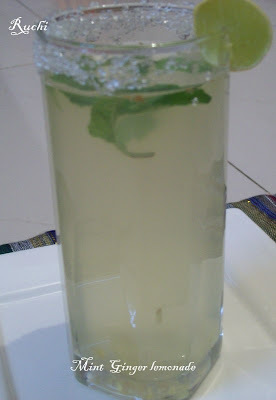 Wow,wat a refreshing and super irresistible lemonade, excellent drink.